OTTAWA – May 30, 2012 – Northrop Grumman Corporation (NYSE:NOC) and L-3 MAS announced plans today to join forces on a variant of the Northrop Grumman-produced Global Hawk high-altitude, long-endurance (HALE) unmanned aircraft system (UAS) for Canada to maintain continuous surveillance of its Arctic territories. Dubbed "Polar Hawk TM ," the system will be designed to stay aloft for long periods of time in harsh weather conditions over vast expanses of the Earth's surface monitoring land, ice, littoral and open water environments throughout the Arctic. 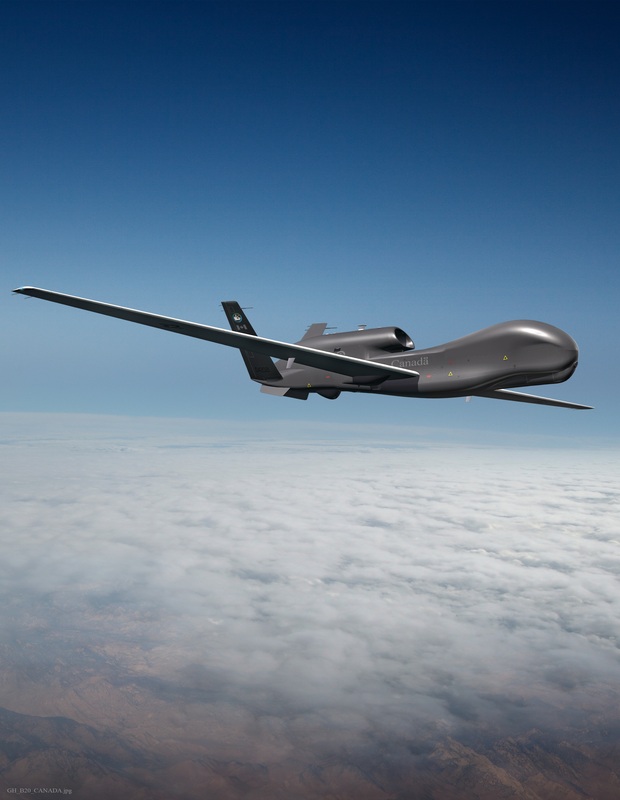 "Northrop Grumman and L-3 MAS are combining our formidable strengths to provide a surveillance system to meet requirements defined in the Canada First Defence Strategy," said Duke Dufresne, vice president and general manager for Northrop Grumman's unmanned systems business. "Polar Hawk's TM operational features are uniquely suited to augment Canada's existing surveillance capabilities and extend its reach to patrol large geographical areas, keeping constant vigil over the nation's vast Arctic region from coast-to-coast in a single mission." "L-3 MAS's expertise in the management and maintenance of large fleets of manned aircraft, its strong heritage in UAS development and state of the art in-service support solutions are a natural fit with Northrop Grumman's global leadership in the design, development, production, operational support and sustainment of unmanned aircraft systems for customers worldwide," said Jacques Comtois, vice president and general manager of L-3 MAS. "Together L-3 MAS and Northrop Grumman have assembled a strong Canadian industrial team to develop a very robust, long-term and affordable turnkey solution for Canada's current and future domestic sovereignty and security concerns over its Arctic territories." Flying at 60,000 feet, well above challenging weather and all commercial air traffic, Polar Hawk™ can range over 22,000 kilometres and stay airborne for more than 33 hours, day or night in all weather conditions. In addition to its surveillance payloads, Polar Hawk™ has the power to support and can be equipped with a wide range of instrumentation for conducting science and environmental missions, as demonstrated by NASA using earlier versions of the Global Hawk UAS as far as 85 degrees north latitude. It can also be deployed to support humanitarian missions and provide surveillance over Canada's vast territory stretching from the Atlantic to the Pacific territorial waters and coasts. L-3 MAS, a division of L-3's Integrated Systems Group, is among Canada's leading providers of aircraft life-cycle extension services, aircraft in-service support services and aerostructures to government and commercial customers. L-3 MAS is headquartered in Mirabel, Quebec, and has operating centres across Canada and in Williamtown, Australia. To learn more about L-3 MAS, please visit the company's website at www.L-3com.com/mas .